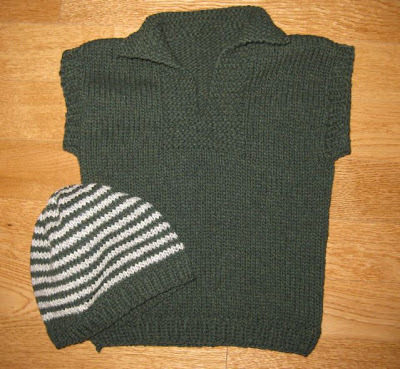 The last bit of the green lambswool was used for this sweater vest and hat for afghans for Afghans. Now, I am trying to use all of the rust wool for another vest, my last for the Youth Campaign. A couple of weeks ago Marilyn emailed and asked if I wanted any Sugar & Cream since it was on sale at Michaels. I told her to purchase 5 or 6 balls for me in muted colors. My nephew delivered them today. 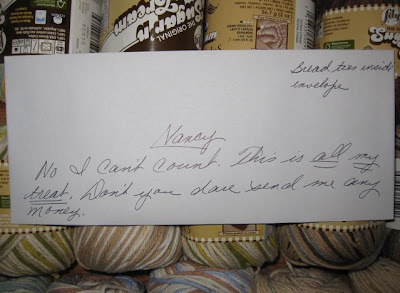 The box was too heavy for 6 balls of yarn so I wondered what else she sent. This is what I found. . .
Did you count them? The box had 26 balls of Sugar and Cream and this sweet note. Is my sister a keeper or what? 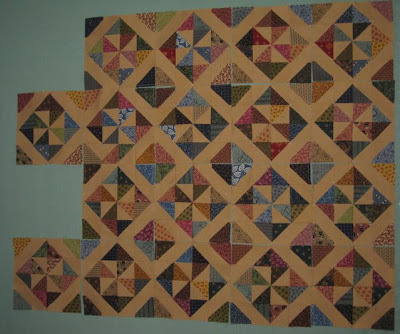 It started with a pile of blocks and strips cut months ago out of odd-shaped scraps. 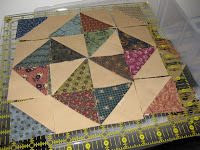 I joined the pieces as leaders and enders while working on my half-square triangle blocks to avoid wasting thread. Curiosity then got the better of me and I began sewing them together to make larger blocks. 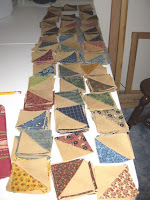 These scrappy blocks are 10 inches and a completed top will eventually be donated to the Heart Strings Quilt Project. Now, I have two on-going projects on my wall: my focus has been side tracked. 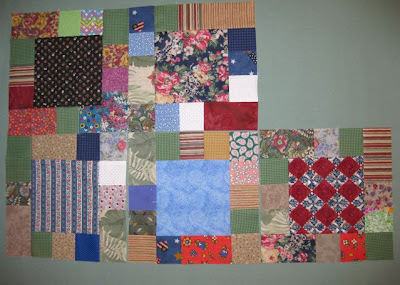 Slowly, slowly, the blocks (8 inches square) are coming together, and the potential quilt top is taking shape. I still have quite a stack of half-square triangles remaining, so this quilt is going to be larger than I first thought. Saturday was a dreary day, overcast and threatening snow, yet a cheery Oddball blanket brought a burst of spring. Green Acres reminded me of the green that will appear in a few months. 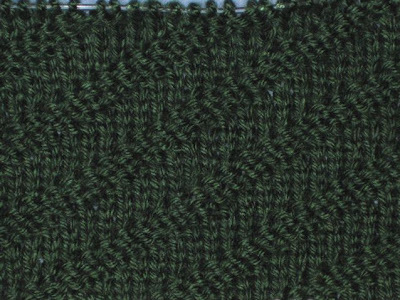 I knit a Diagonal pattern in Caron Simply Soft (Forest Green) which reminds me of the alfalfa windrows on the farm. 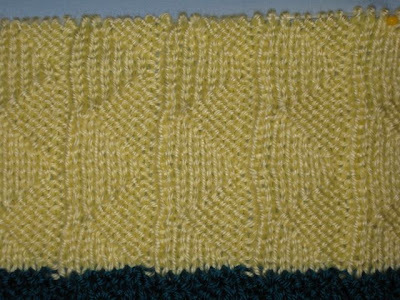 As I knit, I could almost smell the fresh cut hay. Not much crafting has occurred the last two days because I've fallen into a rabbit hole. I put my knitting needles aside, turned off my sewing machine and settled down to read. 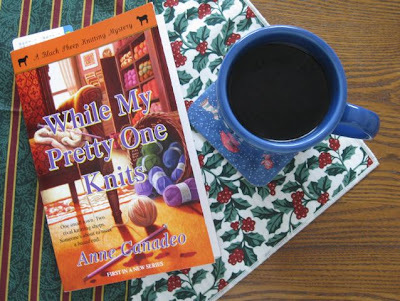 Snuggled in my knitting chair with this book almost makes me feel guilty - almost. 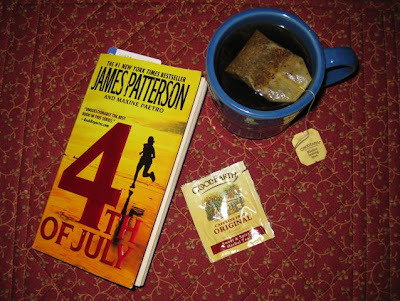 Nearly all of James Patterson's books capture my interest, and this one is no exception. 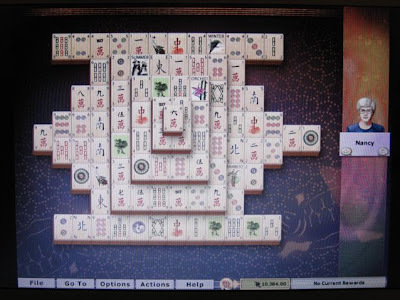 Then, I discovered this tile game on my computer. Oh my, this game is ADDICTIVE, worse than eating potato chips, in my opinion. Yes, I fell into a rabbit hole of sloth, and I'm enjoying myself. 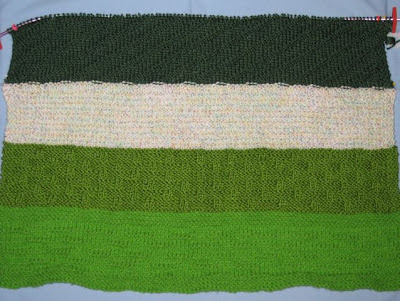 I haven't worked on a West Coast Oddball baby blanket since October: the group took a summer break, and it has been difficult to regain our previous momentum. 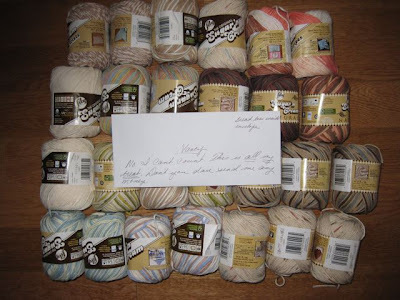 When Holiday Magic arrived in the mail on Tuesday afternoon, I was excited to find a yarn in my stash that would complement the other colors. Yesterday morning, I did some sewing on the quilt blocks, but when my neck began to ache, I settled in my knitting chair and worked on Holiday Magic. I chose Triangle Ribs, a reversible pattern, and a Bernat Satin in a soft yellow, called Banana. One of the problems of having several projects in the works is that one is always pushed aside and often neglected. After finishing the three knit vests, I decided it was time to get back in my sewing room and work on my half-square triangle project. This has been a tedious project with a lot of fiddling and fussing. First came the organization of the scraps - the picking and the pressing, which I did in August. 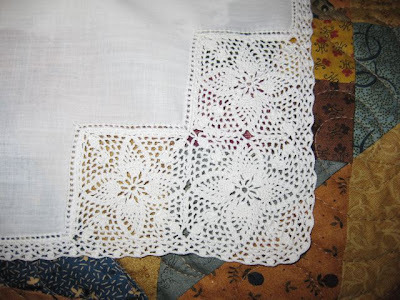 Then, the project progressed to sewing and trimming in late August and early September. I auditioned several layouts for the blocks, and thanks to your comments and opinions, I selected one. 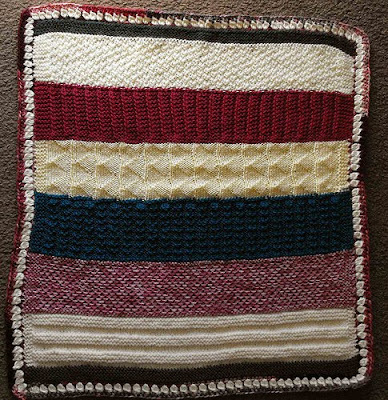 I made the mistake of not trimming the half-square triangles to the same size after they were stitched, which stalled the project for a long, long time. I hated to think about trimming and squaring stacks of the half-square triangles, yet I pushed on and made them all the same size. Monday, I settled in to finally do some sewing. What layout did I choose? Since these are all scraps and I am limited to the number of blocks I can make, I determined that layout "G" would work the best. 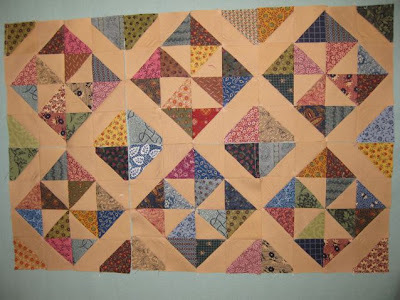 I could easily add sashing and not change the appearance of the block and the secondary design too much. Even though it is slow going (I am working on one block at a time instead of chain stitching), I am making some progress. With any luck, I will use all the scraps and be finally be finished with this fabric. As much as I like the fabric, I am getting tired of working with it. 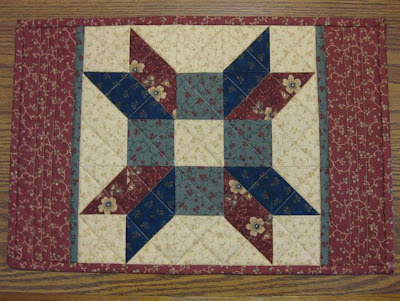 Remember I have made two other quilts with these fabrics: Duluth Stars and Scrappy Spools. 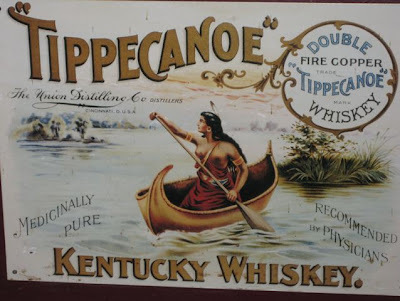 I wonder if this "medicinally pure" product "recommended by physicians" is covered under my prescription drug plan. 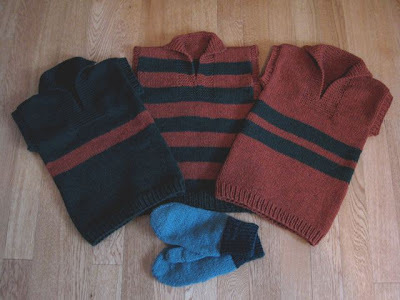 Three youth vests and a pair of mittens are on their way to the afghans for Afghans Collection Center in San Francisco. My original goal was one or two vests, but I had more time to knit than I first thought. The mittens were knit in December. Hopefully, I can finish at least one more vest before the March deadline. 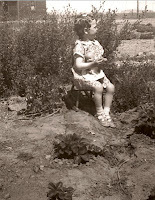 My mother really wanted a little girl, but her first three children were boys. (She was eventually blessed with three girls, of which I am the youngest). Perhaps it was for a laugh, but my mother dressed my second oldest brother (Rich) as a little girl for this and several other photos. His hair was long and was sometimes curled in long ringlets. 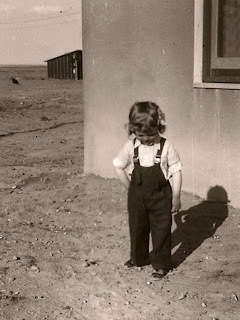 These two photos were taken in the 1930s on the family farm. Rich had dark hair as an adult, but when he was young it was gold, a deep gold that glinted in the sun. I know because my Mom kept the curls in an envelope in her handkerchief box. After Mom died, the envelope of curls disappeared. I would love to have at least one of the golden curls. Since Monday, I have been experiencing the madness surrounding healthcare that is going to become even more prevalent in the future. On Monday, I ordered prescription refills online and noticed that one of my medications was listed as nonrefillable, which was odd because the bottle clearly stated I had one three-month refill remaining. I called customer service and that is where the madness began. I was told, as of January 1, 2010, the drug needed prior-authorization. I would need to contact my doctor who in turn had to contact the insurance company and file a pre-authorization request. Okay, I know this process is understandable for speciality medication, but I don't see how extended-release nitroglycerin capsules would qualify as a speciality drug. I had checked the formulary I received in November to make sure all of my medications were listed and they were. There on the list plain as day was "Nitroglycerin"; however, my error was not digging deeper and seeing if my particular type of nitroglycerin was listed in the unabridged formulary. After my conversation with the representative on Monday, I checked the online formulary. It has a lot of nitroglycerin products listed, but my particular one was not there. Plan B - I called my cardiologist's office and spoke to a nurse. She was surprised about the need for pre-authorization for the extended-release nitroglycerin. She said she would take care of it. Fast forward to this morning. I received a pre-recorded call informing me that the pre-authorization had been denied. The nurse was surprised when I called to inform her and said that she would contact the doctor to try and find a substitute medication for me. I have been taking this drug for four years with great results, and now I am being forced to use a substitute that may or may not be as effective. Healthcare reform has become a popular buzz phrase, but we are fools to believe healthcare reform will be the remedy: it all comes down to dollars and cents, not in our pockets but in the pockets of the insurance companies. Fasten your seat belts folks, this is going to be a bumpy ride. 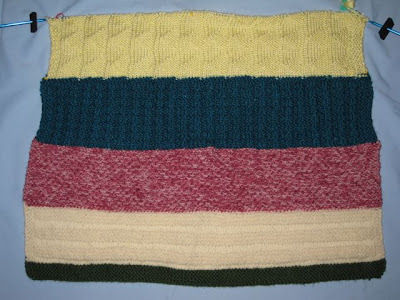 I'm finished with another vest for the afghans for Afghans Youth Campaign. 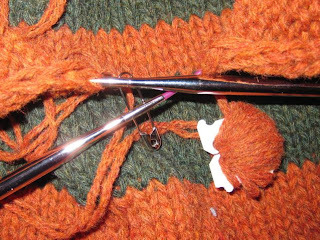 I'm definitely getting better at corralling the yarn bits and resting needles: this time I'm using a safety pin through the adjustment hole in my Knit Picks interchangeable needles to keep them from flopping around. The vest was finished last night. I am going to make one more vest for this campaign. 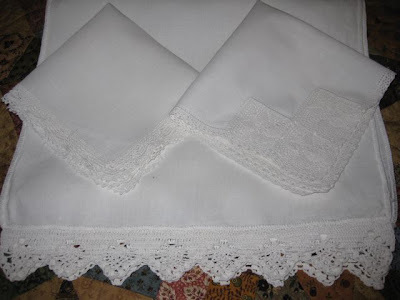 The instant I saw these linen handkerchiefs in the antique mall display I had to have them. 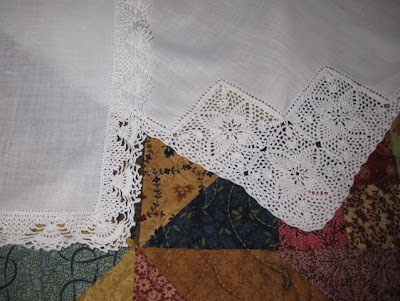 The photos do not do justice to the beautiful lace. Call me old-fashioned, but I still use dresser scarves and handkerchiefs. I wish that I could have rescued even more of the exquisite linens I saw in abundance at the antique mall. 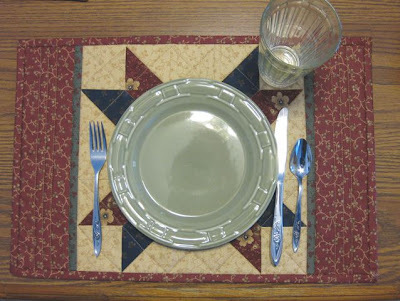 My sister, Marilyn always asks what I want for Christmas, and the last two years I told her I wanted four placemats. This year, I got my wish. 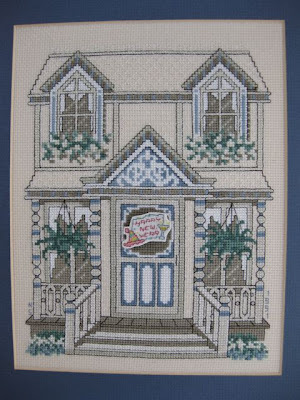 She used Kansas Troubles fabric by Moda and took the layout from a photo she saw online. The fabric matches my dishes, which are red, blue, green, yellow, and purple. I like how the star frames the plate. I think she loves me, but don't tell her I said that. I made several holiday decorations for the door of this Victorian House, but I frequently forget to change them. Two of my goals this year are to change the calendars on time and to wind the clocks regularly - simple tasks but so hard to remember - everyday items lost in the shuffle of Life. This wool vest is for the afghans for Afghans youth campaign. I hope to make at least two more of the vests before the March deadline. 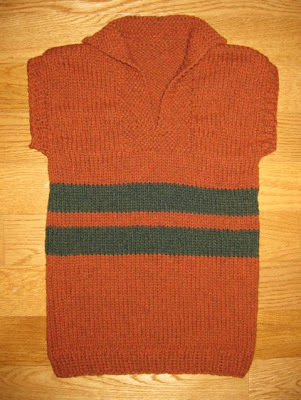 The vest option is at the end of the Steppe Sweater pattern. 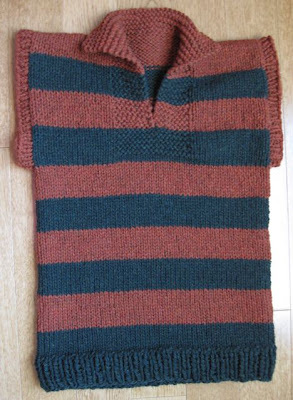 I knit the vest on size 10 needles, using two strands of worsted weight wool. 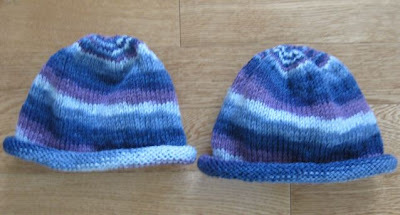 I felt bad that the hats I made earlier for a classroom recess box at a local elementary school were tailored toward the boys, so I knit two rolled brim hats for the girls. While trying to elude an approaching cold, I've been reading the book my sister gave me for Christmas, and it is a quick read. The book brought back memories of the Nancy Drew books I read as a child. I didn't realize until I did some research on this super sleuth that the books were written by different ghost writers but under the pseudonym, Carolyn Keene. Have you read many of the Nancy Drew books?